I know, i know what you’re thinking. You’re thinking you mother……. lying flipping B…., and I know that after what i said on Suits and tie, you could be entitled to think that way but wait. Wait, I even might have a point here. 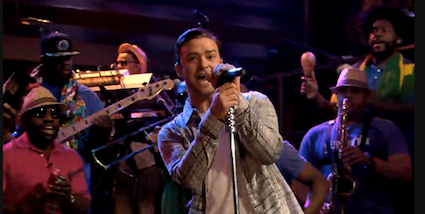 As I was reviewing the whole Justin Timberlake week at Jimmy Fallon’s I did see one moment of true american tv, one of those uptlifting moments that make you want to dance and be better at what you do. I know you know what I’m talking about. So this “Let the groove get” in live moment with the Roots and a whole batucada, back singers etc… has its true moments of good old 80’s uplifting energy and is something you might want to watch if you want to spend the day grooving. Go on, press play, don’t be scared!